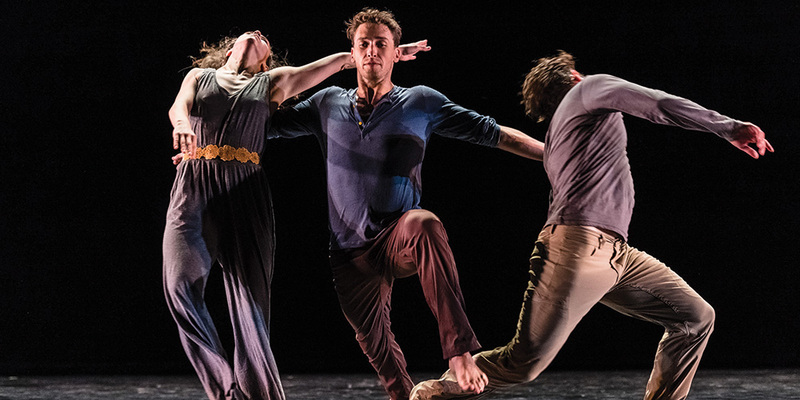 The 2015 d:mic/fac festival was a grand success (check out our BLOG for the highlights)! Over two dozen artists were presented at the Betty Oliphant Theatre in Toronto in three different programs: Mainstage, What You See Is What You Get (WYSIWYG) and Arts Encounters. The d:mic/fac MainStage Series consisted of three different series totalling seven unique Canadian dance works by an exceptional list of contemporary artists including Troy Emery Twigg (Kainai), Fila 13 Productions / Lina Cruz (Montreal), Marie France Forcier (Toronto), Kate Hilliard (Toronto), Jacob Niedzwiecki (Toronto), Andrew Tay / Wants&Needs danse (Montreal) and Throwdown Collective (Toronto). Congratulations to our Audience Choice Awards winners, Toronto’s Throwdown Collective and Montreal’s Parts+Labour_Danse, who also received a gift of flight from WestJet. Andrew Tay / Wants&Needs dance (Montreal, Quebec) – World premiere, You can’t buy it (but i’ll sell it to you anyways) SUCKA. A series of pseudo rituals and dances creates an atmosphere that is impossibly sacred and superficial at the same time. 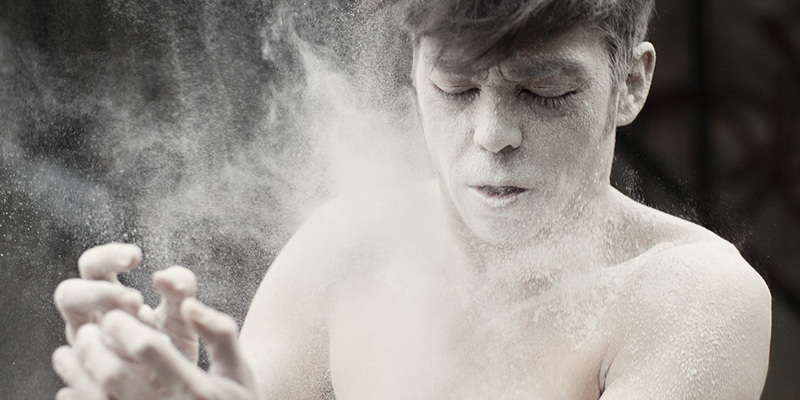 Elements of pop culture and spirituality become interchangeable in this solo performance by Andrew Tay that questions modern society’s connection to the spiritual realm. Linda Cruz / Fila 13 Productions (Montreal, Quebec) – World premiere of Waiting for a sleepless night. Diving into their own personal imaginary landscapes, two buddies wander in the desolate yet enthralling atmosphere of a sleepless night. This duet, performed by Jean-François Duke and Fabien Piché, is derived from the group piece Imaginarium, don’t feed the animals! but has been adapted to be autonomous and have its own specific character. Kate Hilliard (Toronto) – World premiere of La Jeune Femme et La Mort. In the wake of an unwelcome understanding, two performers journey together. Responding to one another and responding to a metaphorical agreement, La Jeune Femme et La Mort discloses a physical conversation driven by time’s uncompromising nature. This partnership tackles identity and the way we can be many things at once. Marie France Forcier (Toronto) – World premiere of Little Guidebook for Using your Suffering Wisely. Based in dark humour and created within a contemporary dance frame, Little Guidebook for Using your Suffering Wisely is about a trauma survivor as she attempts to heal her post-traumatic stress disorder symptoms following the ill-advised guidance of a self-help audiobook narrator. Throwdown Collective (Toronto) – World premiere of Various Concert. Various Concert sculpts space and time in a constantly shifting dynamic of action and reaction. With the anticipation of connection, tension builds as recognizable structures fade in and out of visibility and the three performers gradually find points of intersection. What slowly emerges is a highly attuned dance of unsettled interdependency. Troy Emery Twigg (Kainai, Alberta) – Toronto premiere of Iitaypoyii. Vibrations are transmitted from earth to universe and back again…from heart to soul through body through earth. 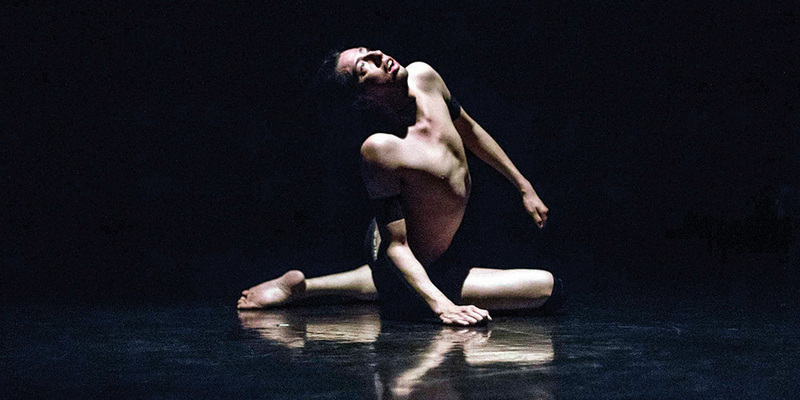 Iitahpoyii, a solo for Justin Many Fingers, embarks on a journey to rediscover knowledge that forms his existence as a member of the Blackfoot Peoples recalling blood/body memory, breath, embodiment and natural rhythms. Jacob Niedzwiecki (Toronto) – World premiere of Unfavourable Geometry. Unfavourable Geometry is a dark dance-theatre comedy that documents a half-century’s worth of small-scale nuclear accidents. 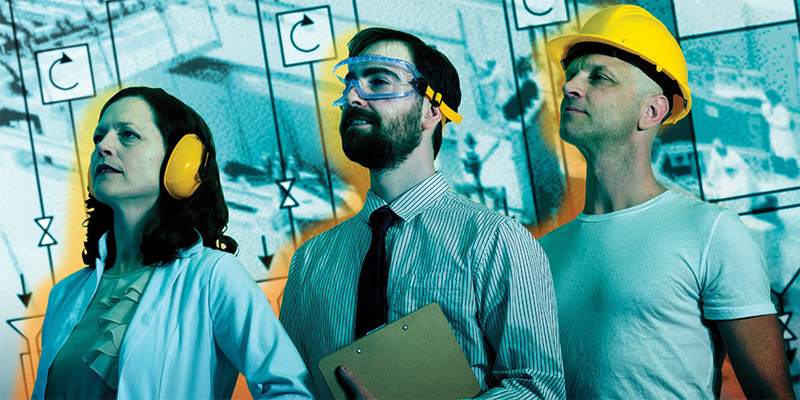 The cold equations of radioactivity react with love triangles, workplace bureaucracy and geopolitics with deadly consequences for hung-over technicians, overconfident physicists and clueless managers alike. Susie Burpee: Spirit and Veneer – A character arrives. We begin to think we know her, maybe even dare to love her. Then, a sudden transformation – and everything we believed to be true unravels. Louise Moyes docuDance: Mavis Gallant Stories – A dance-theatre piece based on a short story of one of Canada’s most distinguished literary figures, expat Montreal writer Mavis Gallant (1922-2014) who lived in Paris from 1950 to 2014. 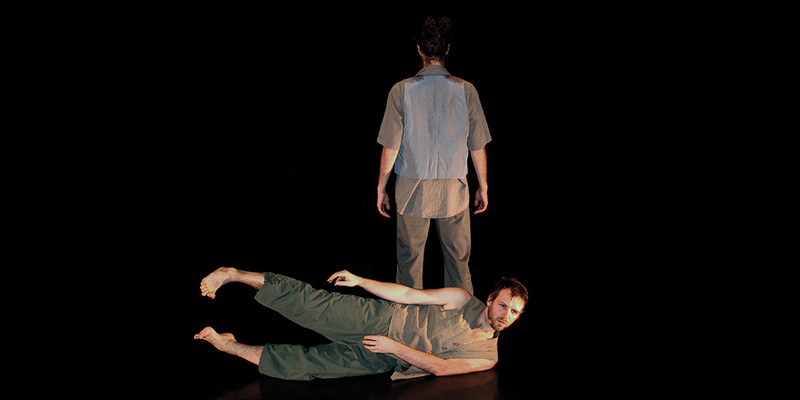 Parts+Labour_Danse: La chute – Dance and performance merge to explore what happens to a man when his identity slips between his fingers until he no longer knows exactly who or what he has become. Alysa Pires: i am vertical – Originally created as part of DanceEast’s ChoreoLab in Ipswich, England, the work is inspired by the life and work of acclaimed American poet Sylvia Plath. 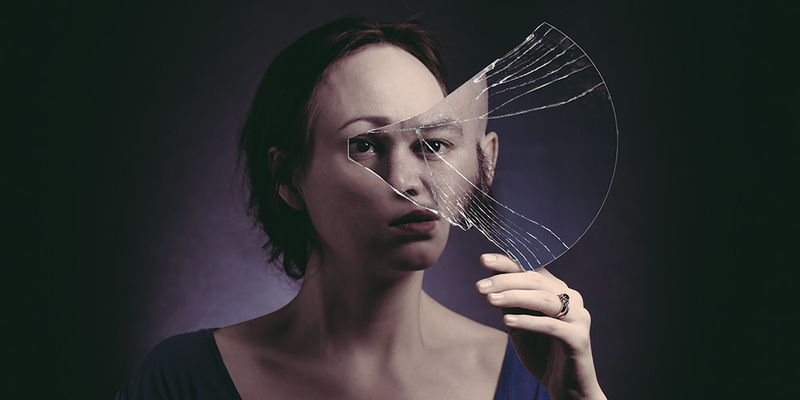 Throughout the festival, the photography of Brianna Lombardo and Andréa de Keijzer will be exhibited in the lobby of the Betty Oliphant Theatre. A participatory activation exploring walking as a meditative practice. Created with Anandam artists, members of Anandam’s Audience In Residence program and you. A selection of dance films will be screened. Learn about QLab, the show control software that can create rich multimedia designs for live performances and installations from Debashis Sinha, our 2015 curator, sound designer and composer.